An Egyptian archaeological mission in Luxor has announced the discovery of a major tomb in the city's west bank area dating back to the 18th Dynasty and containing priceless artefacts. Mostafa Waziry, Director General of Luxor Antiquities, told reporters on Tuesday that the tomb, which was unearthed in the Deraa Abu El-Nagaa necropolis, most likely belonged to the city's counsullor Usrhat. The New Kingdom funerary collection includes dozens of statues, coffins and mummies. 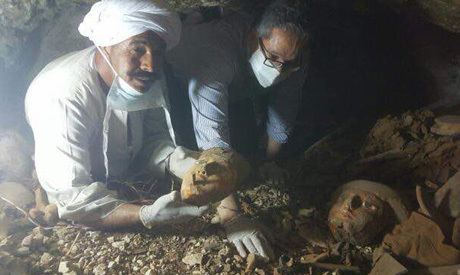 Minister of Antiquities Khaled El-Enany told Ahram Online that, despite the tomb's small size, it represents an important discovery due to the funery collection being largely intact. Waziry, who heads the Luxor achaeological mission, told Ahram Online that the tomb was first mentioned in the early 20th century but it had never been excavated before because its entrance was only located in March. He said that, despite having been reused in the Late Period, the tomb still contains most of its original funery collection. The contents include well-preserved wooden coffins decorated with coloured scenes, as well as wooden funerary masks and almost 1,000 ushabti figurines carved in faience, terra-cotta and wood. Also found was a collection of clay pots of different shapes and sizes. The tomb is a typical example of a nobleman's resting place, Waziry said, with a t-shaped structure consisting of an open court leading into a rectangular hall, a corridor and an inner chamber. Excavations continue to reveal the tomb's secrets, with an inner chamber containing a cachette of sarcophagi from the 21st Dynasty with mummies wrapped in linen. Experts are examining the mummies to discover the identities of the dead and the reasons for their deaths. A nine-metre-deep shaft was also uncovered, connected to two rooms.